Because no one EVER got shot in the face or leg! 13 Responses to Because no one EVER got shot in the face or leg! Always on target, putting the comic back in the book. Because supervillains would NEVER be so dastardly as to shoot him in the kneecaps then bury a blade into his face… It just wouldn’t do nowadays, Niles ol’ boy. At least Bruce Lee would approve of his costume colors. That all change when he face the knife weidling midget! Back to the drawing board! Once again style wins out over practicality. Let’s not forget that even the golden era Supes only ever got shot in the S. He always seemed to dodge the gun when it was thrown though …. As a superhero it is his duty to prevent crime, and the real crime would be hiding those perfectly tanned thighs! It’s weird how a “sheet of his metal” turns into a suit that looks distinctly like chainmail. I don’t know the particular details of this metal that Niles has made, but that seems to be dividing by zero. 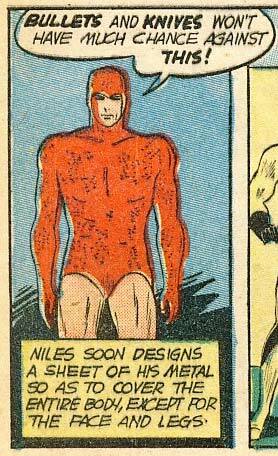 And now we know the origin of Aquaman’s costume. He took it off of this guy’s corpse, and added his own personal touches. Hmmn, I dunno… he ain’t packin’ much crockery there. Okay. Why exactly did he not cover his legs with this miracle metal? Did he just run out of the stuff? Wow. Did I miss this episode of “Frasier”? WAAAAIIIT! [snap] I’ve GOT it! He already had the mask, kneepads, and shinguards because he’s about to debut as SuperUmp, right? !